﻿ Chicago Hispanic Newspaper, Lawndale News, Hispanic Bilingual Newspapers, Su Noticiero Bilingue » Illinois on Track to Become First Smart State in the U.S.
April 25, 2019 5:05 pm You are here:Home Business Illinois on Track to Become First Smart State in the U.S.
Posted by Editor on December 22, 2016 in Business | Comments Off on Illinois on Track to Become First Smart State in the U.S. The State of Illinois’ Department of Innovation and Technology (DoIT) recently hosted the Smart State Roadmap Workshop, a two-day workshop to pursue becoming the first ‘Smart State’ in the nation. “Governor Rauner has charged us to complete a holistic transformation and turn Illinois into a 21st century enterprise,” said Trey Childress, Deputy Governor of Illinois. “Becoming the first smart state in the country is not just about technology; it is about improved processes, governance and above all, improved customer service.” This workshop had more than 50 participants including Deputy Governor Trey Childress, state agency heads, city officials, businesses, universities, national labs and non-profits. 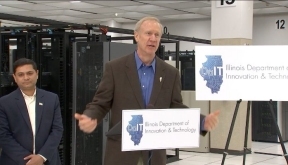 It expanded on the success of the initial Smarter Illinois event held in April 2016 that jumpstarted the state’s technology transformation efforts. The workshop was delivered by the Smart Cities Council, whose partners and advisors have contributed to more than 10,000 smart cities projects internationally. A smart state uses information and communications technology (ICT) to enhance livability, workability and sustainability in its cities, towns, rural areas and state agencies. A Smarter Illinois is ready for the future – harnessing digital transformation in a socially inclusive way that also strengthens business opportunities as well as the state’s brand.